2. Color: Transparent, blue, etc. 3. Size: S, M, L.
4. Type: Embossed or smooth. 1) Waterproof, preventing ache, alkaline, oil, bacilli; Light. 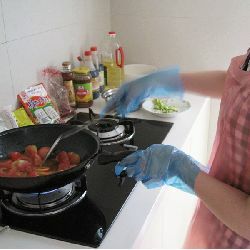 2) PE gloves are mainly used for cleanness of home, test, food or defend of industry or agriculture, haircut, tend and hospital. 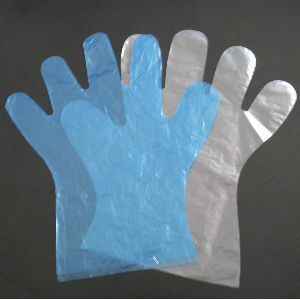 3) We could supply PE gloves (Polyethylene gloves) in all sizes. 4) Sample free; Superior quality with Competitive Price; Fast delivery. 5) Export Market: North America, South America, Eastern Europe, Southeast Asia, Africa, Oceania, MID East, Eastern Asia, Western Europe.